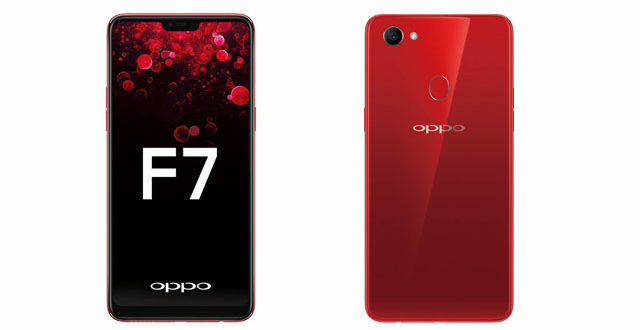 Chinese smartphone manufacturer OPPO launched the OPPO F7 today at a media event in Mumbai. The smartphone is a successor to the last year’s F5 and is a selfie-centric smartphone being in the F-series. It follows the trend of containing a top notch on the front which was popularised by the Apple iPhone X last year. The smartphone measures 156 x 75.3 x 7.8 mm and weighs 158 grams. There is a squarish fingerprint sensor at the back. As for the specs, the OPPO F7 features a 6.23-inch Full-Screen 2.0 display with a resolution of FHD+ (2280 x 1080 pixels) and an aspect ratio of 19:9 because of the top notch. Under the hood, it is powered by a 64-bit Octa-core MediaTek Helio P60 chipset. It comes with two memory variants: 4 GB RAM + 64 GB internal storage and 6 GB RAM + 128 GB internal storage. It contains a triple slot for dual SIM support along with a microSD card slot. Being a selfie-centric smartphone, the optics specs are the most important in the smartphone. The OPPO F7 boasts an AI Beauty 2.0 powered 25 MP front camera with Sony 576 HDR sensor. The company claims the sensor aids in better colour reproduction and detail as compared to its predecessor. The AI features of the camera include the ability to scan more than 296 facial spots along arm and neck as well. Moreover, it can differentiate between the gender, age, skin tone and even skin type of the person in the camera. The AI also remembers the users and observes their habits, automatically switching to the settings the users usually choose. There is also a new feature called Vivid Mode which keeps the face natural but enhances the background. Additionally, there is support for AI-based stickers and group selfie beautification capability. The rear contains a single 16 MP camera with Led flash support for AI features up to 16 scenes. It also comes with features like Portrait and Vivid mode. The F7 runs on Color OS 5.0 based on Android 8.1 Oreo which boats features like Face Unlock and AI remainders such as for tickets or movie. It is backed by a 3,400 mAh battery, which claims to deliver 15 hours battery backup and 33.5 hours of music playback on a single charge. There is also a little help from the Ai as it observes the patters and dedicates the power to the apps during the day. Connectivity features include 4G, VoLTE, Wi-Fi, Bluetooth, GPS and USB OTG. Sensors on board include an accelerometer, ambient light sensor, proximity sensor. As for the price, the 4 GB RAM variant costs Rs 21,990 and will be available via both online and offline stores from April 9 in Solar Red and Moonlight Silver colour variants. The special edition variants called OPPO F7 Diamond Black and F7 Sunrise Red with 6 GB RAM comes with a price tag of Rs 26,990. The special edition variants will only be available via selected OPPO stores. As for launch deals, the company is holding a special 24 hr flash sale on April 2 for 10,000 units at Flipkart and 777 OPPO stores. Customers from the flash sale will be getting 5% cash back on purchases through ICICI credit cards and get additional 120 GB 4G data from Reliance Jio and up to Rs 1,200 cash back in 12 months, apart from a one-time free of cost screen replacement from the company’s authorised serviced centre.